The balisong knife makes an excellent pocket knife. This excellent pocket knife comprises two handles which can rotate in such a way which enables them to hide the blade of the balisong knife; thus, making it the perfect concealed carry knife. 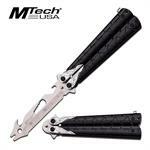 More commonly, the balisong knife is also known as the butterfly knife or the butterfly trainer knife. Traditionally, this amazing knife hails from the Philippines; it also holds a crucial position in some martial arts methods. The Balisong knife is well known for catching the attention of everyone due to its unique built and design. Not to mention the fact that the wielder of the balisong knife can conduct a variety of amazing balisong knife tricks. The Balisong knife is without a doubt one of the most popular knives today. With that being said, much of this is contributed to its amazing and unique design. Not to mention the fact that one can do some amazing tricks with the balisong knife and draw loads of attention and admiration from family and friends. Many historical analysts agree to the aspect of the origin of the balisong knife which is believed to be the Philippines. Nonetheless, the origin of the balisong knife is still up for debate even today. Nothing can be stated for sure in this regard; however, the two countries to be focused at with regards to the balisong knife are France and the Philippines. Many people cite the Philippines as being the origin and birthplace of the worldwide famous balisong knife. Legend says that the balisong knife dates back to the ancient 800 AD. However, much can be debated about this as well. It is stated that the purpose of the earliest balisong knife was utility as well as self defense. The style and features of the balisong knife allowed a quick knife deployment; whereas, the balisong knife could be used single-handedly and with efficacy as well. The rich tradition of the balisong knife can be witnessed in the Philippines even today; particularly, in the province of Batangas where they sell a huge variety of the Balisong knife at different prices. Most importantly, the terminology of the "balisong" originates from the Filipino language itself; therefore, the majority of the historians and analysts hold the viewpoint that the balisong knife originated from the Philippines. As mentioned earlier, there are two schools of thoughts associated with the origin of the Balisong knife; one of them favors France as being the birthplace of the world-wide popular balisong knife. It is claimed by some people that the balisong knife was invented in the French territory during the 15th and 18th century. The reason for this claim stems from the tool named "Pied Du Roi", which is a French term and originally translates as "Foot of the King". 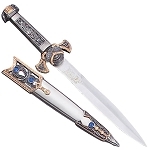 The "Foot of the King", or "Pied Du Roi" resembled the balisong knife in its style and form.  Therefore, many consider that the first butterfly knife was invented in France instead of the Philippines. It is also argued that the balisong knife was adopted by the Spanish merchants and sailors who then introduced it to other countries whilst bringing it to the Philippines as well. This version of the origin of the Balisong knife might sound true; however, nothing has been proven so far in this regard. More interestingly, it has also been argued that the origin of the balisong knife in Germany as well as the United Kingdom. In fact, the balisong knife has been traced back to these countries in the years that preceded the 20th century. However, nothing can be stated with full conviction while keeping in mind that the earliest form of the balisong knife dates back to the 800 AD in the Philippines which leaves us with the question about the true origin of the balisong knife, also known as the butterfly knife. The lore of the balisong knife being originally from the Philippines has been passed down from the older generations to the newer ones for a long time. On the contrary, the French territory has even images along with documents with the measurements of a tool that resembles the form and style of today's balisong knife. The French pictures and documentation date indicate that the balisong knife dates at least a hundred years back leading to France. The documentation of the French version of the balisong knife, however, indicates that the tool was more likely a measurement tool instead of a hidden knife. In this regard, it is somewhat hard to tell whether that version of the "supposed" balisong knife could have been used for personal defense, and other normal tasks, such as flipping which associated with the balisong knife. Therefore, the history of the origin of the balisong knife is to a great extent still a mystery which needs to be solved. Regardless of its vague history, the balisong knife is in great demand today. Much of the credit goes to the amazing "flipping" tricks that one can maneuver while wielding the balisong knife. The "flipping" trick includes acts, such as spinning and tossing the balisong knife while performing a variety of cool tricks and wooing the mesmerized audience. The best way to start flipping the balisong knife is to use a butterfly knife trainer for this purpose. The trainer version of the balisong knife is made of dulled blades; therefore, these cannot cause accidental injuries to the wielder as well as bystanders. Another benefit of training with the balisong knife trainer is that it is relatively cheap as compared to the original balisong knife. Furthermore, if you are looking for a balisong knife which will last longer along with making sure that you don't get impacted by accidental injuries and cuts; it is recommended to get the trainer version of the balisong knife. Typically, there are two structures which are common for the balisong knife; the sandwich build of the balisong knife, and the channel build of the balisong knife. The "channel" structure of the balisong knife is considered to be the stronger version of the balisong knife. It is considered to be stronger due to the fact that the basic parts of the balisong knife handle are manufactured while using one piece of the material. The handle of the balisong knife comprises a groove as a result of the carving which is also the point where the blade of the balisong knife is located in its folded position. On the other hand, the sandwich version of the balisong knife is more typical for the beginner knife version as well as the butterfly knife trainer. This version of the balisong knife is made up of different layers that have been unified one-by-one. The many pieces of the balisong knife are held together via screws or pins. 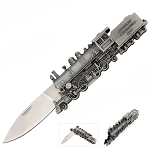 Most interestingly, the balisong knife is manufactured from the recycled parts of the cars as well as the railroad. 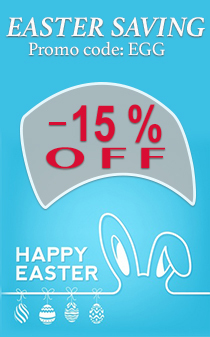 If you are a beginner, it is recommended to get the sandwich style of the balisong knife. A balisong knife is a concealed blade; therefore, it is considered a knife that can be maneuvered in form of a potential weapon as well. Due to its quick knife deployment and threatening built, the balisong knife has been banned and declared illegal in many parts of the globe. 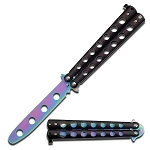 In contrast to the balisong knife, the butterfly knife trainer is legal in many areas due to the blunt blades and other unsharpened features; however, the original sharp version of the balisong knife is outlawed in many regions of the world. Despite the fact that it is believed that the balisong knife originates from the Philippines; yet, there are strict rules with regards to the carrying of this hidden knife blade. Due to the widespread use of the balisong knife in crimes, the balisong knife has been declared illegal to possess and carry without a proper permit as well as identification; this rule is mostly institutionalized in the capital city of the Philippines. Referring to the urban areas of the Philippines, it is mandatory to demonstrate and prove that one is in dire need for carrying the balisong knife for a valid purpose, such as in the form of the farming tool; martial arts instructor; as well as other needs where one livelihood depends on the balisong knife. The law for categorizing a knife as a utility knife in the Philippines demands the knife to not exceed the length of one's palm. Furthermore, the knife cannot be or ought not to be able to be opened with one hand; only then, can it be considered a utility knife and the wielder of the knife is allowed to carry it without fear of the law. Generally, it is illegal to carry a balisong knife in the majority of the regions of the United States. In the books of the American laws, the balisong knife is labeled as a "dagger"; a "switchblade", and, even a "gravity knife", depending on which jurisdiction and locality one resides. Therefore, before purchasing the balisong knife from an online store or looking for it the flea markets, it is recommended to check in with the local law enforcement department with regards to the legality of the balisong knife or the butterfly knife trainer. The Californian state does not permit the carrying of the balisong knife if the length of its blades exceeds two inches. 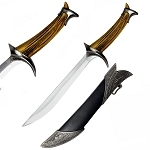 However, you are allowed to own and keep the balisong knife along with other versions of the automatic knives if these are kept only at home as collectibles. If you are planning for a vacation in Hawaii, it is best to let your balisong knife rest at home since the state does not permit the carrying, possession, selling, transferring, manufacturing, and purchasing of the balisong knife at any cost. Even the state of Kansas carries legal restrictions on the possession of the balisong knife. The state of New York does not classify the balisong knife as a "gravity knife". However, the state of Oregon has clear-set rules with regard to the balisong knife where it is straightforwardly deemed as an illegal weapon to carry and own. Most interestingly, the state of Texas categorizes the balisong knife as a "switchblade"; hence, it is illegal and a crime to carry, own, possess, manufacture, sell, purchase, and knowingly, as well as intentionally transport this version of the switchblades within Texas. As long as you won't carry the balisong knife as a concealed carry, you are allowed to carry a balisong knife in the state of Utah where the butterfly knife is termed as a legal knife. With regards to the open-carry and concealed carry of knives, the balisong knife is perfectly legal to own, possess, and carry in the state of Virginia. Nonetheless, you might find some restrictions in the various areas of the state; therefore, it is always recommended to check in with the local laws before taking the balisong knife onto the streets of Virginia. The state of Wisconsin has relaxed laws with regards to the balisong knife; you can carry it in a concealed manner as well. However, you will have to ensure that the balisong knife never leaves your property. If you are the kind of person who loves to impress his/her family and friends with some amazing tricks with the balisong knife, you can find a great balisong knife for the best price. However, it is recommended to start your training on a butterfly knife trainer before getting your hands on the real version of the balisong knife. The balisong knife can provide unlimited entertainment and fun for any user.